As the name suggests, ‘levator’ sounds like elevator and scapulae referring to the scapula or shoulder blade. The levator scapulae is found on either side of the neck and is responsible for lifting the shoulder blade. The muscle begins on the top few vertebrae of the neck, and inserts on to the scapula and is located underneath the trapezius muscle. Trigger points located in this muscle can cause stiffness in and around the neck area, and can also refer pain along the shoulder blade. You can tell if you have this trigger point by trying to turn your neck as if looking out the rear view mirror of your car. You may not be able to fully turn your head to one side if there is a trigger point. The function of the levator scapulae is to raise and lower the shoulder blade, and that movement is exactly what causes trigger points. Bad posture and being constantly hunched over or stressed can cause the shoulder blades contract all the time, putting immense pressure on the levator scapulae, as it is working overtime to keep your shoulder blades up. 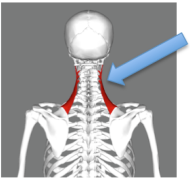 As it is also connected to the neck bones, the levator scapulae can also help to turn your neck from side to side, thus trigger points in this area can hinder the muscles ability to perform accurate movements. Many things can cause trigger points in the levator scapulae, for instance; sleeping on your side without proper head support, backpacks, purses, typing while looking to one side to see a piece of paper and even holding a phone between your head and shoulder. This muscle can also be stressed by emotional tensions and over exercise. As a pair, the levator scapulae muscles help to keep your head from slumping too far forward when it is down, so habitually have your head lowered can cause significant trauma to this area. There is an easily accessible trigger point located just above the shoulder pain, which can be manipulated quite easily, however, this is not the main trigger point that causes most of the pain. The trigger point that causes most grief is located underneath the trapezius muscle is the back. In order to get to it, you will need to press quite firm to relieve any trigger points there. You can use a ball against a wall for the lower trigger points in the back. Another easy to reach trigger point in the levator scapulae is one located behind the top of the sternocleidomastoid (neck) muscle; this can be worked with just our thumb and fingers.